Wow! What a week this has been! I completed editing and publishing my FIRST podcast for this journey! Now, if you listen to it, there are a couple little blips but overall, it went well. I have NO intro or exit music yet. I am going to hire someone to put this together for me. Someone other than me. For this first recording, I set up with a simple folding chair in my clothes closet (which was like being in the perfect padded sound studio…it was amazing!) with my Tascam digital recorder on a tripod. I ran an extension cord under the door so I didn’t have to worry about battery loss in the Tascam. When I was done, I took out the SD card and completed editing the sound file using my Mac Book Air’s preinstalled application called Garage Band. Tascam Digital Recorder – I already had this awesome device from previous interviews I used to do when I interviewed artists. It’s awesome because it gives me high quality recordings, transports easily anywhere (you can use a battery if you need to) and it uses an SD card to easily transfer the audio files to your computer for editing. Garage Band application – used this to edit my podcast. I watched a Garage Band podcasting video on Lynda.com to get up to speed real quickly. In the past, I used the open source application called Audacity for editing my audio files. Garage Band was really easy once I knew the basic controls. If your super new to podcasting, there’s a bit of a learning curve that online tutorials will help you with. Skull Candy Noise Cancellation headphones – having great headphones is a must for recording and these are my favorite. I have no shame and will wear these big babies ANYWHERE! Mainly because I despise ear buds because their painful, annoying and most won’t fit properly in my ears. Recorded, edited and published Podcast 1. 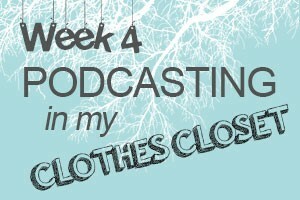 Although I recorded Podcasts 2 & 3, I did not edit the audio files yet. I did not review strategy recording that I had with business coach and write a blog post about it. Content scheduling in CoSchedule for at least 30 days in advance for Twitter and Facebook. To remove the verbal hesitation “UM” from my everyday conversation vocabulary so I won’t use it during podcasts or any other form of public speaking. Add Podcast link to main horizontal menu at top of my website. Refresh the WordPress plugins page to have a landing page rather than a list of blog posts that have a plugin category.